Here at Martello, we are looking back on a truly banner year of milestones met and some great corporate accomplishments. What we are most proud of? Truthfully, it is our amazing team and the way in which they have continually risen to meet the opportunities to support our community. 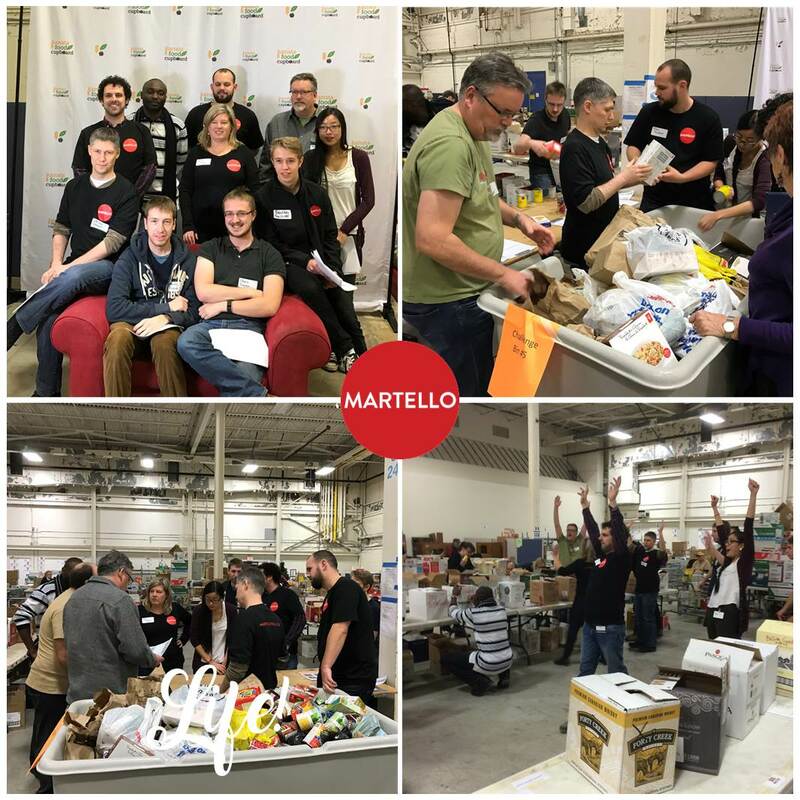 What does a year of giving look like at Martello? Read on. The Big Bike | This year, we jumped at the opportunity to support the Heart & Stroke Foundation by participating in their annual Big Bike fundraiser. Together with our neighbors, ProntoForms we hopped on the Big Bike for a pedal powered tour of Kanata North and together we managed to raise $3000 for life-saving heart and stroke research. Employee Gift Giving Program | Five months ago, we introduced our Employee-Directed Gift Program. It’s our unique way of honouring the hard work of our employees, by contributing to the community organizations that matter most to them. As our blog series has chronicled, it’s been exciting to see the ripple effect of these contributions. Our emhttps://martellotech.com/blog/ripple-effect-chronicling-community-impact/ployees are making a growing impact in the community and we have loved seeing the diversity of organizations that our employees are passionate about. Through this program, we have had the opportunity to contribute to more than 6 organizations in just 5 months, including the Cochlear Implant (CI) Support Group of Ottawa to help them offer real-time captioning at their group meetings. We have also contributed to both the Maverick Athlete Benevolent Fund and Holy Trinity Badminton Club that both work hard to increase access to sports and build a strong community of athletes. Kanata Food Cupboard | In December, we capped off the year by spending an amazing afternoon participating in Kanata Food Cupboard’s annual corporate food sorting challenge. This initiative helped to support families in our community through the Adopt a Family program and we were proud to be able to make a special holiday for two local families. At Martello, we want to wish you and yours the happiest of holiday seasons – however you celebrate, taking the time to be with family and friends as we welcome a new year is truly one of the greatest gifts of the season. Take a peek at a little seasonal video we put together and happy holidays to you and yours – we can’t wait to see what’s in store for 2017! Yes, we all know how the age old story goes but if you are in charge of monitoring your company’s network, the holidays can pose significant challenges as you try to ensure reliability with a skeleton staff. How can you stay one step ahead of the game, so you can be sipping eggnog with your feet by the fire? Our customers will tell you that the answer is Mitel Performance Analytics (MPA). Already offering a full suite of performance monitoring and management tools, the upcoming release of the software (R2.1) may just be the ‘hot new toy’ that all network administrators want under the tree. Why is MPA R2.1 the ‘Must Have’ New Toy? This software suite helps administrators manage enterprise deployments and allows partners to proactively detect and address performance issues on customer networks. It looks pretty shiny and new and there are some great features that you can start leveraging right out of the box including secure remote access and 24/7 system monitoring. Want to know what else to expect? Did Someone Say ‘Full Feature Parity with Enterprise Manager’ – This release of MPA 2.1 sees complete Enterprise Manager feature parity which includes moves and deletes in the advanced user operations (AUO) for MiVoice Business. This version sees single and shared sign-on to MiVoice Business and alarm in-browser notification replaces the system tray. Also improved in this version are SDS error rates with alarms. Our Special Gift To You: Expanded MiVoice MX-ONE Support – You have been waiting for it and this release delivers expanded MiVoice MX-ONE support that includes route and gateway utilization, scheduled backups and results reporting with both extension AND terminal registration. This release also sees an improved IPT user dashboard with voice quality reporting and status monitoring for MX-ONE services. Alarm Analytics – you know your network is producing valuable data, and analytics can help you leverage that data into better performance for your users. Every day you are inundated by alerts and alarm fatigue can quickly settle in. With analytics, you are able to rate alarms based on how you react to them and create and follow labels that matter to you. In a sea of data, alarm analytics ensure that you SEE the issues that matter most to you. Simplified Licensing & Onboarding – In the New Year you can get your new customers licensed and running on MPA quickly using the improved System Configuration Wizard. Need to add new devices to MPA? The Device Discovery tool quickly scans the network to find available devices. The holidays can be hectic and pose many challenges for network administrators. MPA lets you rest easy over the holidays knowing that your network is fully monitored. At Martello we are just coming down from the high of last week. We had the opportunity to open up our doors for Startup Open House then, part of our team were lucky enough to attend SaaS North. After getting back to the office and discussing the conference with our other Martellians there were several themes that came up consistently – we have tried to distill them down into four things we ‘know for sure’ since coming back. We all get caught up in it – the day-to-day of making a SaaS business succeed. This conference really let us be critical, take that step back and take stock of the decisions we were making and really question the strategic direction we were taking. Why does this company exist? What customer problems are we trying to solve? For our team, taking the time to ask some of these questions and hearing about how other industry titans are tackling the same issues was extremely valuable. One thing that we heard over and over again at SaaS North was how small can truly be mighty. We know that in this industry you can sometimes feel like a ‘little fish in a big sea’. What was consistently communicated by many SaaS founders, experts and thought leaders was how agile and responsive smaller SaaS shops can be. Small means that you can build close relationships with your customers and nurture a rich company culture, all while developing a killer SaaS. Another consistent message at SaaS North was to stay on top of what’s coming next – and be ready to pivot. This is an industry that can move at lightning speed and you need to be ready to hustle. What does that look like? It’s finding the right balance between planning and acting to capitalize on the right opportunities. It means knowing what problem you’re solving and what differentiates you from the rest. At Martello we have always thought that SaaS was kind of a big deal – we do develop a pretty nifty performance management solution for unified communications after all. It was amazing to be at a conference (in our hometown!) that was laser focused on SaaS thought leadership, networking and delivering thoughtful content. SaaS is gaining traction and some would even say that SaaS North truly signalled Ottawa’s shift from a telecom to a software city. We can’t wait to see what is next for SaaS growth and already have the next SaaS North dates firmly written into our 2017 calendar.